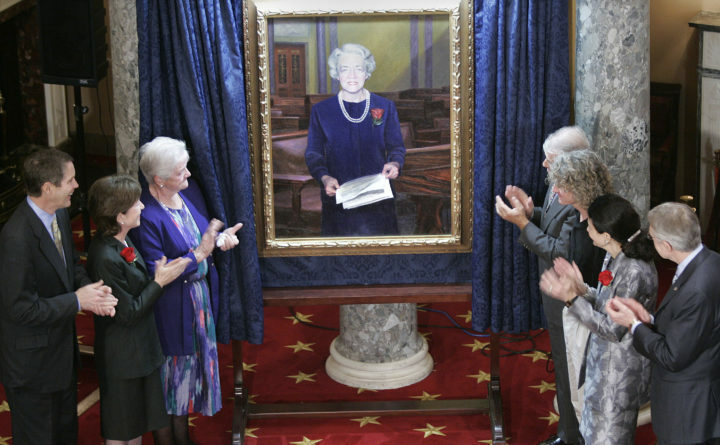 Dignitaries applaud the unveiling of a portrait of former Maine Republican Sen. Margaret Chase Smith at the Capitol in Washington, Oct. 18, 2005. Attending are (from left) House Majority Leader Bill Frist of Tennessee; Maine Sen. Susan Collins; Anne St. Ledger Herrin; John Bernier; Ronald Frontin, the South Thomaston artist who painted the portrait; Maine Sen. Olympia Snowe; and Senate Minority Leader Harry Reid of Nevada. Leadership is a term that we all toss around, assuming we know what we mean and that we are all using the term in the same way. In Maine, the need for discussions on leadership is taking on greater urgency: Do we have the leaders we need? Are our leaders doing a good job? Could they do a better job? How do we prepare the next generation of leaders? The most recent Maine Policy Review is devoted to examining leadership questions: How do approaches to leadership need to be transformed? How do we tackle such dilemmas as drawing on past leadership lessons when the future will likely call for types of leadership that we can’t even begin to imagine? I’ve quoted some of the authors below because their direct words are great starting points for the conversations we need to have together in Maine. Other articles focus on the rapid changes in the Maine economy and implications for what might be needed in leadership. One of the pieces (“Collaborative Leadership is Key for Maine’s Forest Products Industry”) documents the great losses in Maine’s forestry industry, yet points out “with good leadership, times of trouble can become times of opportunity.” The researchers (Brooke MacDonald and colleagues) report on new approaches to collaborative leadership now being implemented in this key Maine industry. Maine has a well-deserved reputation for its exceptional past leaders. One of the questions revisited throughout the articles is how to draw on that history as we move forward into new times. In her article Linda Cross Godfrey, an important leader in eastern Maine, reflects on what she learned from Margaret Chase Smith both through observation and through correspondence. Her essay includes excerpts from correspondence between the two and we are asked to think about what Smith’s leadership means for us now and what lessons we might take into the future. I encourage you to take a look at this exciting and accessible Policy Review issue. It is easy to find: there is a copy at every public library in Maine. You can also freely download any and all of the articles by going to https://digitalcommons.library.umaine.edu/mpr. The way we will make progress is by engaging one another in addressing these issues. Linda Silka serves as executive editor of Maine Policy Review at the University of Maine in Orono. She is a professor emerita of the School of Economics and retired director of the Margaret Chase Smith Policy Center. This column reflects her views and expertise and does not speak on behalf of the university. She is a member of the Maine chapter of the national Scholar Strategy Network, which brings together scholars across the country to address public challenges and their policy implications. Members’ columns appear in the BDN every other week.